Saute onions with olive oil, then add rice and continue. Add hot stock, one ladle at a time while stirring the risotto to massage out the starch from the grains. Finish with butter and parmesan. The perfect risotto should have an individual bite to each grain, not an overcooked rice-pudding like texture. It should also be freely flowing, and not overly stiff. This is one of the most common crimes against risotto. Let me say this, if your risotto sticks to the underside of an upside down spoon, it is too stiff! A proper risotto will slowly ooze, like a slow flow of lava! Mushroom risotto is a classic dish for the fall. Mushroom stock can be created by soaking dried mushrooms, with porcini carrying the most prominent umami flavour for the base. 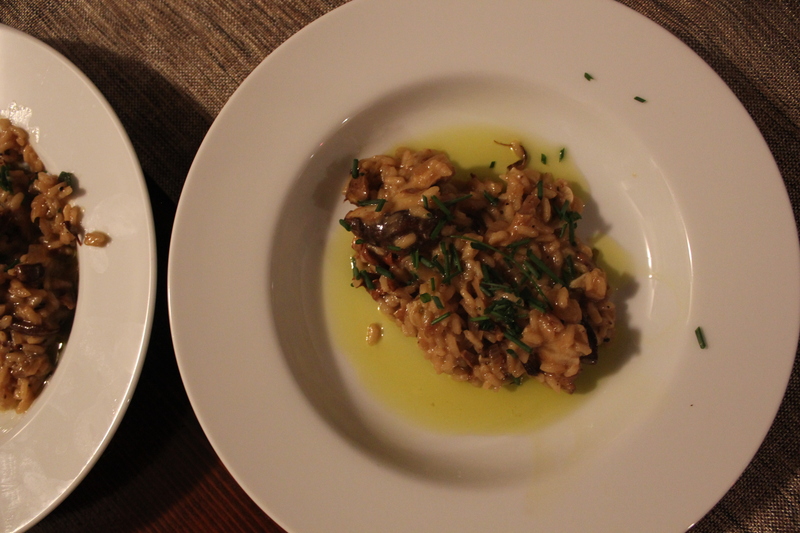 The re-constituted mushrooms can then be added back into the risotto for flavour and texture. I like to finish the risotto with an assortment of whatever fresh mushrooms I can get my hands on, sautéed to bring out their earthy flavour. 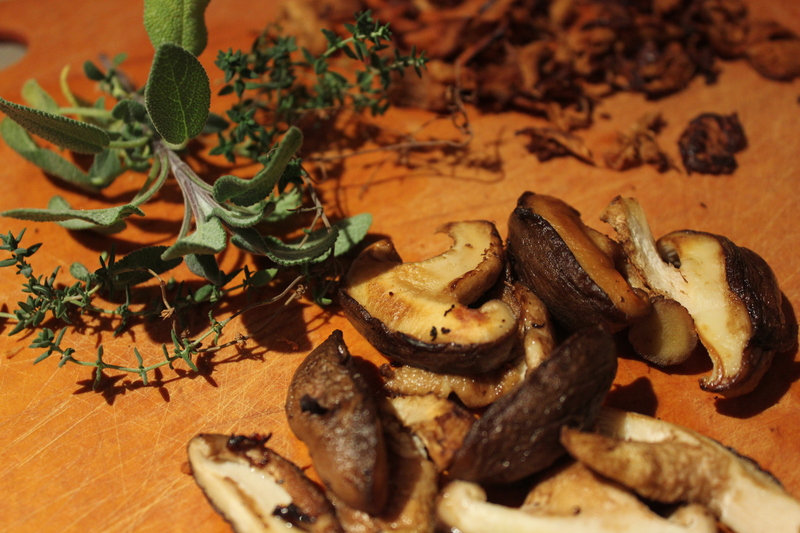 Re-constitute the dried porcini mushrooms by adding them to a bowl with the hot water. Let sit for about 15 minutes, then remove and roughly chop the mushrooms and reserve the liquid. In the meantime, add the stock to a saucepan and maintain at a simmer. If using frozen mushrooms, sauté in a spaced out layer over medium heat to remove the moisture. You can just let them sit if they are well spaced enough, until they are slightly browned and much more dry. Remove from pan and set aside for later use. Saute the fresh mushrooms over high heat with a glug of oil. Make sure to develop some good colour on the mushrooms. Remove from pan and set aside for later use. Reduce pan to medium high heat, add another glug of oil, then add the onions and garlic. Saute until onions just begin to brown, then add the rice and another glug of oil. Stir the rice and onion mixture continuously to coat all of the rice grains with a bit of oil. The idea is to toast the rice slightly before beginning to add the liquid. Just as the first rice grains begin to turn opaque, add the wine along with the sage and thyme, as well as the porcini mushrooms with their liquid and stir vigorously. After the rice absorbs about half of the wine, add a ladle full of hot stock and continue to stir. Don’t allow the risotto to become too dry throughout this process, as it will damage the individual grains and the consistency. The stirring should always be easy and the risotto flow back and forth in a wavelike motion if the pan is shaken. Continue to repeat this process one ladle of stock at a time until finished. The constant stirring is critical, as it massages out the starch of the rice grains and gives the risotto its characteristic creamy consistency. Don’t be alarmed if the rice has a slight bite to it after the stock is used up, as risotto should have this texture. Remove pan from heat once the risotto is done cooking, then add the sautéed mushrooms, butter, cheese, chives, lemon juice, and salt and pepper. Secret step: add 2 tbsp of good olive oil to the finished risotto, then gently fold ingredients together. This is the critical step for developing a lovely, oozing risotto. No saffron? Heinous. Add the saffron to the wine. Saffron contains both water soluble and alcohol soluble components, so allow it to infuse the wine for 5-10 min. And warm the wine; never add cold fluid to the rice, as it will congeal the starches. Yes, this includes at the beginning right after the rice has been toasted. I prefer to add a bit of hot stock first, let that absorb, then add the saffron infused hot wine in the next ladle. No saffron on hand, but if I did I would surely make Risotto Milanese! That’s what I call simple perfection. Do you always add saffron to your risottos? Come to think of it, I’ve never considered warming the wine at all! I always follow the rule when adding stock, but completely overlook it at the wine stage. Thanks for pointing that out, I’ll have to try that change to the process next time. Heinous?!?!? If I wanted a traditional recipe, I’d be reading a traditional european cuisine website! Your intuition is dead on, as usual. Here at home it’s the season of the mushroom harvest, and you, as a champion of expansive and exploratory local cuisine have hit the nail on the head — the time to restock your pantry with saffron is when mushroom season is over! Of course, the risotto has to be perfect, but as you say — it’s the canvas — and best to start with a blank canvas!